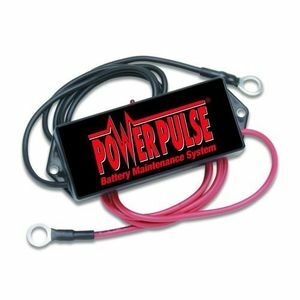 48-Volt PowerPulse - eliminates sulphur buildup on battery lead plates, boosts power output and gives you 3 to 5 times longer battery life!. This Pulsetech product also works on two or three 48-volt batteries connected in parallel. IDEAL FOR MOTIVE EQUIPMENT. The 48-Volt PowerPulse is designed to ensure maximum battery performance on 48-volt lead-acid battery systems. It's ideal for virtually any kind of high-voltage vehicle or equipment that is charged on a regular basis. This includes golf cars, electric vehicles, gensets and all types of motive equipment like forklifts, scissor lifts and much more. In fact, it has been documented to increase vehicle and equipment range by enabling the battery to accept, store and release more available energy. Comes with lugs that connect directly to the battery terminals. Powerpulse is not a charger, it cleans sulphur from lead plates allowing the battery to hold more power and perform like a brand new battery continually. * Ensures peak battery performance by eliminating the main cause of lead-acid battery problems. * Works on all lead-acid batteries including gel cell, antimony, hybrid, calcium plate designs. * Provides greater charge acceptance so batteries recharge faster and with better quality. * Easy to install and includes an LED on the curcuit box that indicates the circuit is energized and the unit is working. PowerPulse collects a small amount of energy from the battery, reconditions it and then pulses it back into the battery as a dc current. These pulses re-energize the lead sulfate deposits on the battery plates, remove them from the plates and returns them to the battery avid as active lead sulfates.